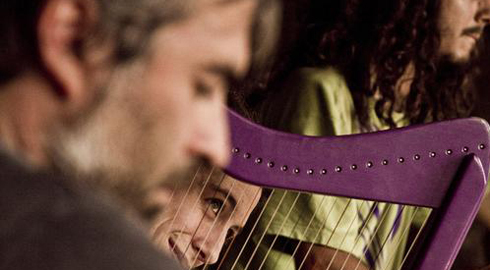 Reshà is created in 2010 when Maria Di Pace ( Argentinian guitarist and harpist ) and Leonardo Trincabelli (Uruguayan percussionist and hangist ) meat in Barcelona for recording what would be the Leonardo`s second solo album "Release ". Product of that reunion and once finished the recording, they continued playing transforming the essence of the album in what is now this new project "Reshà", which later added other musicians of the Barcelona scene. Reshà converge in the very different musical careers of its members, thus opening an unknown spectrum in which both musicians and spectators are part of a unique experience. Reshà prefers to be described as a unique sound rather than being labeled under a genre. When the melodies and rhythms of the Harp and Hang merge, begins a journey into an inner world, deep and unknown. The sound of Reshà speaks of ancient roots through simple harmonic motion; slow heavy beats and silent depths that provide respite, walking the dreaming way, where the shadows of modernity are discovered in warm melodic spots. Reshà made numerous open spaces concert in Barcelona, Berlin, Stuttgart and Paris. This year is planing a tour of 3 months; in Germany, Holland, Belgium, France, Italy and Swiss, playing in festivals, concert halls and theaters, presenting their first album.